It’s longer – and deeper – than any other train tunnel in the world. 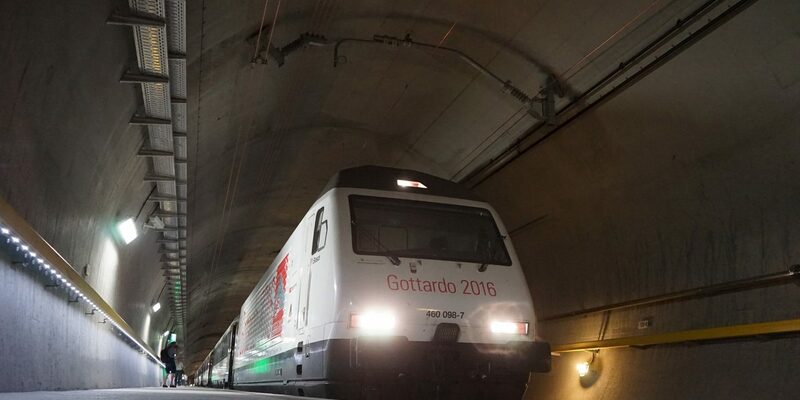 Sunday 11 December 2016 sees the entering into service of the Gotthard Base Tunnel. This pioneering project will enable passengers to speed under the Alps in some 17 minutes. The dual-track tunnel will bring northern and southern Switzerland closer together, and cut travel time between neighbouring countries. It will permit passengers from near and far to spend more time at their destination, discovering the many delights of Switzerland north and south of the Alps. Switzerland already possesses the densest public transport network on the planet. And over the years it has increased its impressive lead over other nations. June 2016 saw the festive inauguration of the Gotthard Base Tunnel – a 17-year pioneering project which extends for 57 kilometres down to a maximum depth of 2300 metres under the Gotthard massif. The Swiss Federal Railways (SBB) have now finished subjecting the tunnel to exhaustive safety and technical tests. On Sunday 11 December – the day on which Switzerland’s public transport network changes its annual timetable nationwide – the Gotthard Base Tunnel will enter into scheduled service. This tunnel of spectacular superlatives is more than a masterpiece of railway engineering – it is also a commitment to efficient, safe and sustainable train transport through the Alps. The Gotthard Base Tunnel will permit passengers to travel under the Gotthard massif in some 17 minutes. It will cut 30 to 40 minutes off travel time from German-language to Italian-language Switzerland. The new traffic artery will mean faster and more frequent connections, using modernized and new rolling stock. The Gotthard Base Tunnel is a compelling reason to explore the north and south of Switzerland by public transport.